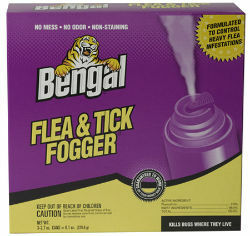 Formulated to control heavy flea infestations. Kills fleas, ticks, ants, flies, and lice. Dry fog is non-staining, leaves no mess and no odor. Treats up to 9,000 cu. ft. for fleas and up to 18,000 cu.ft. for ticks.